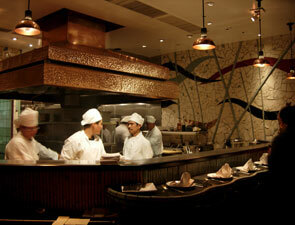 The open kitchen concept is a key attraction at Chinois on Main. The kitchen is covered by a large hood that's illuminated with pendant and spot lighting. There is bar-like seating where one can watch all the action of the kitchen up close and personal. If you don't like the heat, not to worry: The kitchen is visible throughout the restaurant. When we were there, we saw at least six chefs in their whites and hats scurrying furiously about the kitchen to feed the constantly-packed restaurant. The counter at the kitchen is made of bamboo, similar to the bar, and can seat up to six people. The centerpiece of the kitchen is a giant copper hood that's surrounded by at least five pendant lights and multiple spot lights so that you can see everything as clear as day. This is the one area of the restaurant that has plenty of light and not too much red. 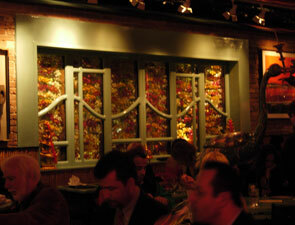 As you enter Chinois on Main, the right wall is also adorned with artwork. The real star of the wall, however, is a cutout that's filled with glass and framed in celadon, curvilinear to match the undulating wave shapes that one will notice throughout the restaurant, which Barbara Lazaroff has called "energy waves." Behind the glass lies a wall of fresh orchids, which we're told are changed weekly. Because they're behind glass, you really can't touch or smell the flowers, but the yellow, white and fuchsia flowers add to the restaurant's abundant Asian theme.